Enjoy the adventures of the Silver Hill Boys. This is a great read for young and young at heart, with 8 full color pages and note pages at the end to start your own adventures! The Silver Hill Boys Official Secret Railroad Club Shirt! 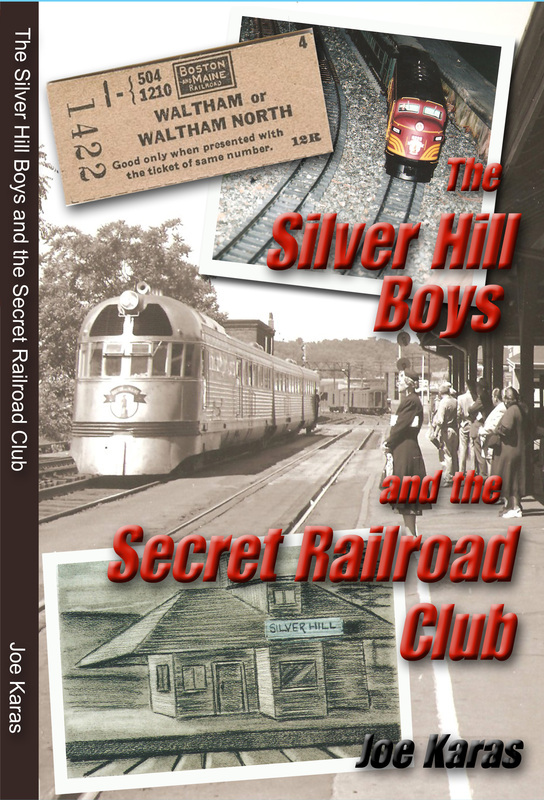 Be the first in your neighborhood to wear the official Silver Hill Boys and the Secret Railroad Club T-Shirt! The Boys’ favorite F-Unit B&M Engines are on the back of the shirt with the words, Boston and Maine, proudly displayed on the lead engine! A stunning black shirt contrasts the silver art work and silver lettering! These are quality shirts that will take almost endless washings. Front of the shirt has Logo over left chest. Sizes: S M L XL. What a great reflection on a style of life in the 40’s and 50’s that will never be seen again. A time when ice skating was on a pond, baseball was in a sandlot, the policeman on the corner was your friend, the engineer in the train waved to you as they rode by. Train buff or just a proponet of a simpler life, this is the book for you. Great for today’s youngsters to read and use their imaginations. This is an any age, any walk of life, type book. One to be read and cherished if just for the memories.